In 1967 or ’68, a plumber doing renovation work on a building in a quiet North Center neighborhood of Chicago broke through an old wall to discover a hidden space. 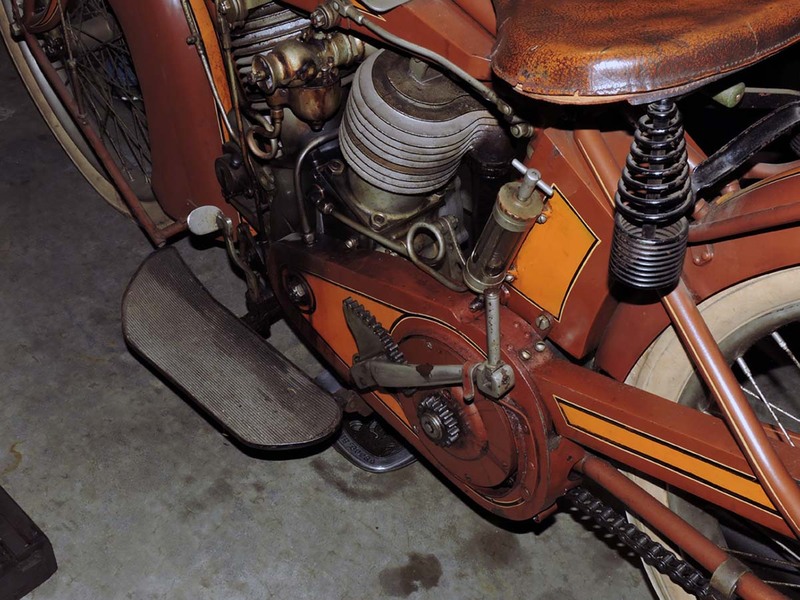 Inside this time capsule, hidden for over 50 years, stood a pristine motorcycle. The paint, white rubber tires and even the leather of the seat were incredibly well preserved, and it was soon realized that almost every part of the bike had been meticulously hand crafted. 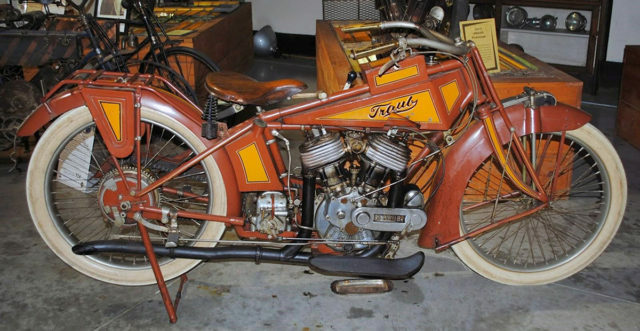 It was truly an one-off, possibly one of the rarest motorcycles in the world, and the only clue to its origins lay in the name “Traub” which was painted on the tank and cast on the engine covers. 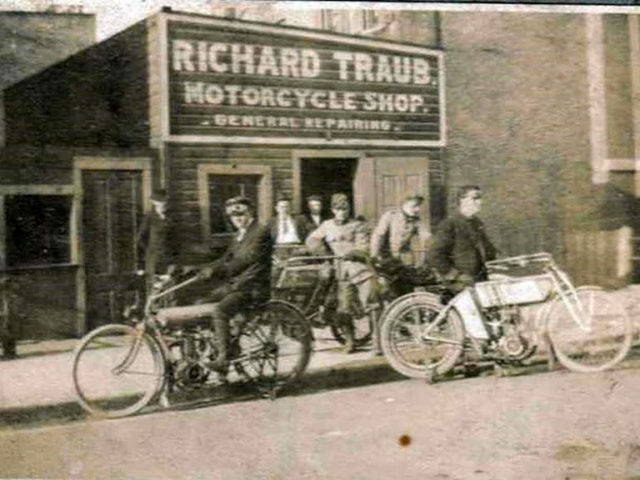 The elderly owners of the building were tracked down and told about the mystery, and they admitted that their son had stolen the motorcycle in 1917; how it came to be walled up in the building is still unknown, and after their son had been killed in the First World War it had been left there all but forgotten. Almost every item on it had been engineered and manufactured specifically for this bike; aside from a Schebler carburetor, Bosch magneto, Troxel Jumbo seat and a period wheel rim there are no shared components from any other motorcycle of that era. The pistons are hand made and have gap-less cast iron rings and much of the engineering and machining is years ahead of its time. 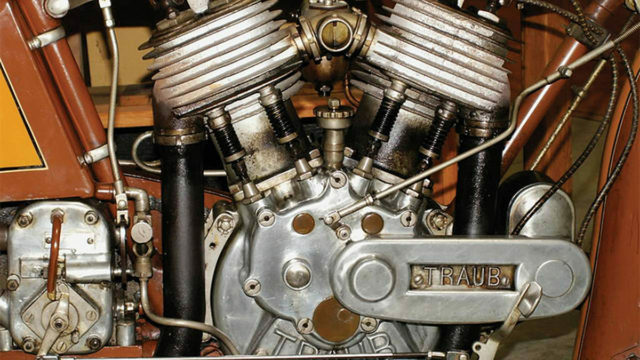 The v-twin engine is unique to the Traub and is a sand-cast, hand-built, 80 cubic-inch, side valve, motor, while the three-speed transmission is thought to be one of the first of its kind. 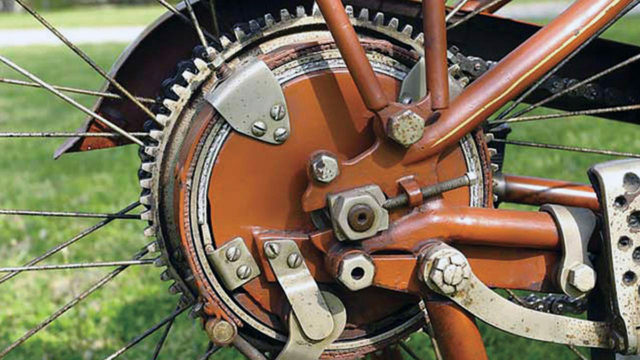 The rear brake setup is also unique and consists of a dual-acting system that employs a single cam that pushes an internal set of shoes, while pulling an external set of contracting shoes. The motorcycle utilizes two clutch levers; a conventional foot-operated mechanism, and also a hand lever that sits alongside the fuel tank on the left-hand side. 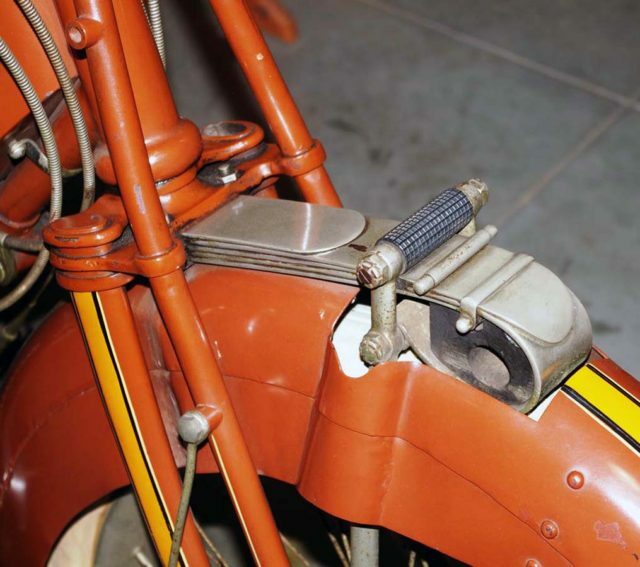 The lever gate for the shifter is also unique, operating what could have been the first three-speed gearbox on an American motorcycle. Even more, the transmission also features two separate neutral positions, which are marked on the shift mechanism with a zero. These are found between first and second gear, and between second and third gear. The powerhouse is a beautifully crafted 78ci V-twin engine with a 4in stroke and a 3 7/16in bore, yielding an engine capacity of 1,278cc, which was large for the time. 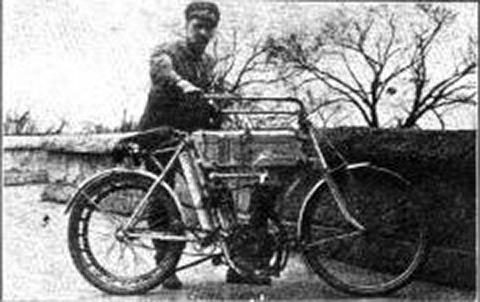 The majority of big displacement motorcycle engines from the Traub’s era were around 1,000cc (61ci). Using a side-valve arrangement, the top of the cylinders feature a gas primer valve, and it’s fitted with an adjustable crankcase breather and unique engine mounts. 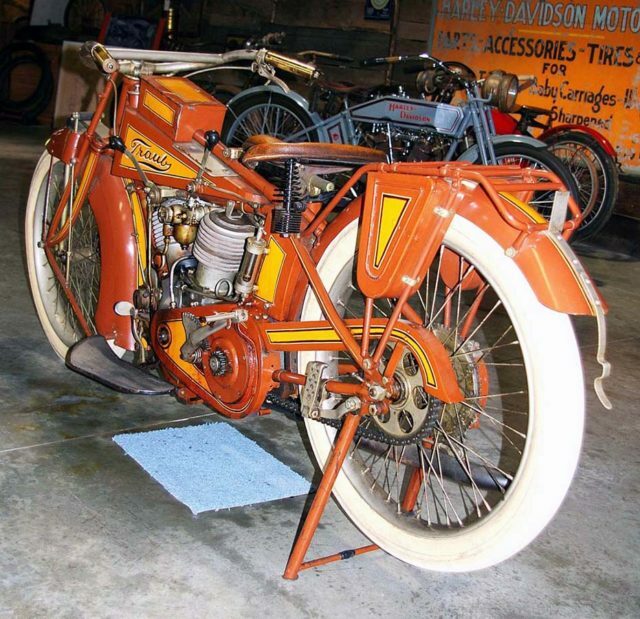 The motorcycle was first traded to Torillo Tacchi, a motorcycle shop owner in Chicago in exchange for a $700 Suzuki. Tacchi restored it and kept the bike for some 10 years. He later sold it to Bud Ekins (Steve McQueen’s stuntman) while Ekins was on set of the Blues Brothers movie in the late 1970s. The Traub was later sold to California collector and restorer, Richard Morris, who then sold it to Wheels Through Time Museum curator, Dale Walksler, in 1990. It has been on permanent display in the museum collection ever since. Allegedly the only parts that had to be fabricated in the final restoration were the base gaskets; the bike is so perfectly machined that no other gasket was used anywhere in the engine, one more significant indicator that this was not a mass-production machine. For many years a mystery lingered as to who had built the Traub, and whether any other examples existed. 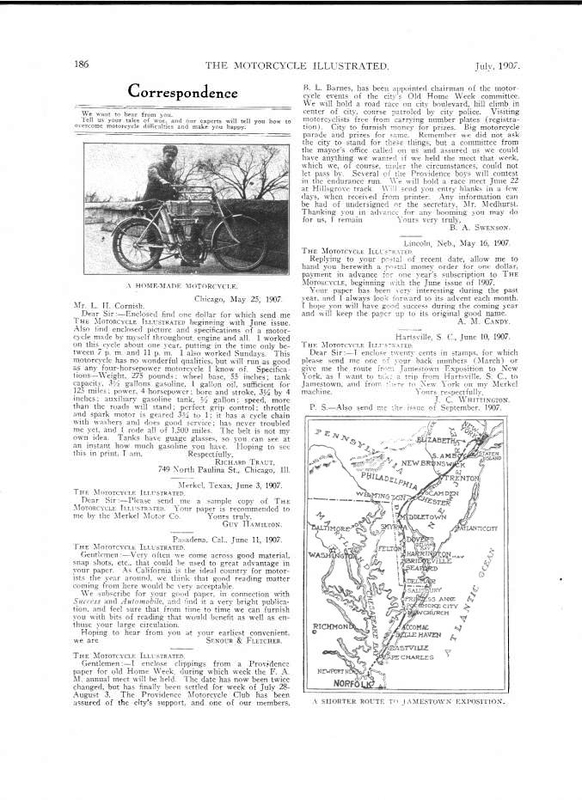 “Dear Sir – Enclosed find one dollar for which send me The Motorcycle Illustrated beginning with June issue. Also find enclosed picture and specifications of a motorcycle made by myself throughout engine and all. I worked on this cycle about one year, putting in the time only between 7 pm and 11 pm. I also worked Sundays. This motorcycle has no wonderful qualities, but will run as good as any four-horsepower motorcycle I know of. Gottlieb Richard Traub is listed in the 1900 census at this address; his occupation was simply noted as “a laborer”. 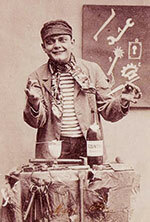 By 1930 he had moved to Park Ridge Illinois, possibly as plater or chromer at an experimental company. His 1942 draft registration card has him self employed in Park Ridge. There are references to him building telescopes in Park Ridge in the 1940’s, and he died in 1952 aged 69. He was buried in Concordia Cemetery, Forest Park Illinois. It should be noted that North Paulina st. in Chicago is in the same neighborhood, and in fact may be the same street, as the building where the motorcycle was found in 1967. 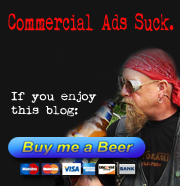 I get shivers of pleasure from this story. So unbelievably great! I love every aspect of this bike and it´s background. That is truly incredible machining and mechanical insight, especially considering the time the ride was built. Rest in peace Mr Traub, through your motorcycle you shall not be forgotten.